A community benefit fund from wind turbines at Ysgellog Farm is helping a judo club in its search for young members. 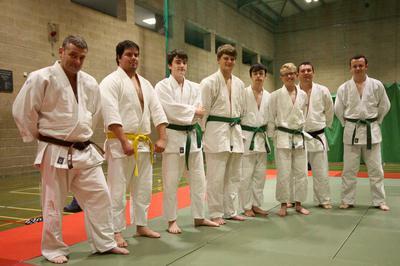 The Amlwch Judo Club realised they needed an influx of young members and applied for a grant from the Ysgellog Community Benefit Fund to help promote their Primary Section. Their Primary Section is open to children under 10 years old and they train at 5.30pm on Tuesday evenings at Amlwch Leisure Centre, Pentrefelin. "We had lots of Primary members a few years ago. They have trained hard and are now Seniors at the club. For the sustainability of the club, we need some new younger members to join us," says Mike Owen, Instructor and Chair of Amlwch Judo Club. "We were delighted to receive the money we asked for and we’ve used the grant to send letters to every primary school, run a special beginners’ course and create a new leaflet. It helped us get our message out there. We ran a short course for under 10s and were successful, but we are still looking for some more members," says Mike. Applicants for the second annual Ysgellog Community Benefit Fund are being considered at present, with decisions on which projects will receive grants being announced in December 2014. Last year, seventeen community groups on Anglesey received a share of the community benefit fund. A local Community Advisory Panel, consisting of nine local residents and elected representatives, help to assess the applications and recommends where the money should go. "We have a number of organisations who support us. Without funding and our volunteers, we couldn’t continue as a club. Get your kids off the sofa and help them get fitter and learn a new skill. We could even train an Olympian for the 2024 games!" says Mike. The wind turbines at Ysgellog Farm contribute £13,800 per year to local projects. The details of the fund’s criteria and information to check your project meets all of the requirements are available at www.grantscape.org.uk. "It has been brilliant to see the 2014 fund supporting the Amlwch Judo Club and other worthwhile causes this year. We look forward to hearing about the projects and the local people who benefit from the grants in the coming years," says Sophie Moeng, Communications Manager, Airvolution Energy. Contact Eirlys Hayes, Amlwch Judo Club Secretary, 07867 796 883, for more details about joining the club. Further details about Airvolution and project news from the wind turbines at Ysgellog Farm can be found at www.ysgellog-wind.co.uk.